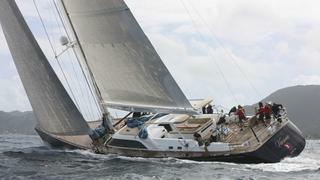 Joost Goverts at Northrop & Johnson Spain sends word that he's listed for sale the 30.2 metre sailing yacht Varsovie. Built in GRP by the Finnish yard Nautor's Swan to a design by German Frers, she was delivered in 2008 as the last of the Swan 100 series to leave the yard and and benefits from steady improvements made to the series over the years. Redundancy and backups were key elements in designing the navigational system. There are two completely independent chart plotting systems – one operating on the Furuno NavNet system and the other on a pair of identical PCs. There are dual monitors at the navigation station plus monitors at each helm making it possible to display any combination of chart and/or radar at any station. A comfortable saloon has a dining table to starboard with a 42 inch television and L-shaped couch to aft. Electric blinds on the side windows provide privacy when in dock. Joost Goverts says that she would be ideal as a two owner boat because she has two equal sized master suites plus two further guest cabins providing for a guest complement of eight. All cabins have en suite shower facilities. Under power, a 350hp Cummins engine gives Varsovie a range of 2,000 nautical miles and she is asking €6.95 million. Subscribe to BOAT Pro to access brokerage sales data and unlimited specs for 11,674 yachts in our Superyacht Directory – the world’s most comprehensive superyacht data.